One young teenager from Brookline is making a difference in an artistic effort to give back where he has been given a second chance. 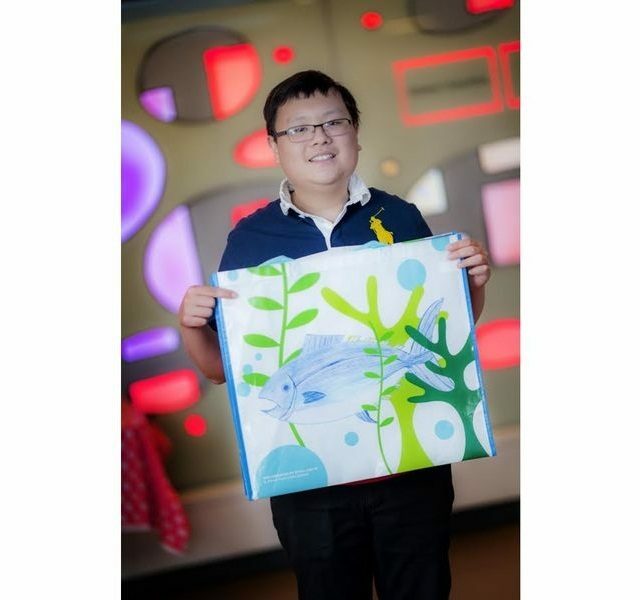 Evan Yu’s artwork is being featured this month at HomeGoods stores where his artwork can be seen on a reusable shopping bags there. The colorful limited edition blue and green bag features an ocean scene with fish and coral. And it is on sale for $0.99 in participating HomeGoods stores across the country as part of their 16th annual “HomeGoods Helps Families Fight Cancer” campaign to benefit the Jimmy Fund, according to a spokesperson for Dana Farber. For every bag sold, HomeGoods will contribute $0.50 to the Jimmy Fund. Evan Yu, and a rising senior at Brookline High School student, is himself a pediatric cancer patient at Dana-Farber Cancer Institute’s Jimmy Fund Clinic in Boston. He was treated for acute lymphoblastic leukemia. I am feeling better. He finished treatment recently but has to go in for a monthly check in. Interested in stories like this? Sign up for them to arrive in your inbox with the Brookline Patch Newsletter. In late 2013 Evan was experiencing muscle and back pain, but he was also doing rock climbing, so everyone thought that was the cause of the pain. But one morning in early 2014 he could not get out of bed. His mom took him into urgent care, where they had blood work done. The next day the results came back and they told him he needed to go to the hospital the next day. He spent six weeks in the hospital and then after that it was weekly visits to Jimmy Fund clinic sometimes more for him as he underwent treatment. A couple of years later, and he was done with treatments, said his mom. Now he is down to monthly visits. It was one one of these visits while Evan was waiting for some lab work that staff suggested some activities. Evan does not always participate in the activities but when he heard it was drawing, he thought he would join. The staff told him it was for a competition, but Evan said he did not think too much about winning. It served him well. Out of all the submissions, Evan and another girl’s drawings were the two selected to grace the cover of HomeGoods Shopping bags for the month and for donations. Melissa Yu, his mother, said an official at Dana Farber told her they printed out 50,000 bags. The family has bought a number of the bags to give out as presents, and family and friends have told her they have bought the bag in Texas, Florida and New York. In his spare time, Evan enjoys kayaking and fishing as well as drawing and watching the Boston Bruins. He is just finishing up an art class and he is getting ready to start touring colleges and sitting down to write some college essays this summer. He says he is leaning toward mechanical engineering. In addition to sales of the limited edition reusable shopping bag, more than 415 HomeGoods stores are participating in a fundraising campaign that goes until June 28, 2017. Shoppers can participate by making a contribution at the register. And all contributions will benefit the Jimmy Fund, which supports pediatric and adult cancer care and research at Dana-Farber Cancer Institute in Boston, MA.